December 14, 2005 was my thirty-first birthday. Thirty seemed like a milestone, but I wasn’t expecting much for thirty-one. I was looking forward to breakfast in bed or cake and ice cream. What I got instead was much different. From Thanksgiving until my birthday I had a horrible case of asthmatic bronchitis. This landed me in the hospital with a nagging inability to breathe for over a week. So, when I awoke at 3:00 AM on December 14th not feeling well, it was no surprise. It was a surprise that the left side of my body felt numb and tingly. It was a surprise that it felt like a ton of bricks was pushing down so hard on the left side of my being that I truly could not breathe. It was a surprise that I felt extraordinarily thirsty and confused. With my husband, Troy, of six and a half years sleeping soundly beside me and our 22-month-old son, Drew, in the room next door, I decided to get up to have a glass of juice. I just knew if I gave myself a few minutes, the feeling would soon pass. It didn’t. As I walked the short distance to the kitchen, my left foot was oddly dragging the ground. I reached for the refrigerator door but could not make my left arm grab the handle. All the while, I kept thinking about my left arm and a heart attack. The weak leg did not make any sense. I could still move but it was like the signals in my brain were not firing to tell my left hand or leg where or how to move. So, being the brilliant young woman that I am (please note the sarcasm in my voice), I decided to Google search my symptoms. My inability to lift my left leg caused me to trip up the few steps toward the computer as I fell flat on my face on the dark carpet. Still, no cause for alarm, I was truly confused. Once I settled in front of the computer, my fingers hit the keyboard quickly searching things like “left side weakness” but instead my search terms looked like this: “lxwn aiwb awknqqa”. It took just a moment to register, but I suddenly realized my right hand was typing the correct keys but my left hand was randomly hitting keys on the keyboard. I was too scared, confused, and exhausted to figure out what was happening. I vaguely recalled an excruciating headache while attempting to decorate our Christmas tree the day before but I was confused and felt miserable. I fell back to sleep on the couch. Sleeping until around 5:30 AM, I had a gnawing feeling that my symptoms were more serious than side effects from my previous medication. The numbness wasn’t going away. Something was wrong and Google did not fill in the missing gaps. I finally and timidly woke my husband for fear of what was to come next. I explained the odd feeling on the left side of my body. Suddenly wide-eyed and alert, he told me to speed dial my doctor. I did and then we headed to the emergency room (after fighting for a shower and some breakfast). Yes, it sounds ridiculous but I had just been in the hospital for a week and my experience told me this may be my only chance for a real shower for some time. It was true and at least I walked into the unknown clean. After a nap and a shower it was clear I was willing to wait for whatever news they were about to deliver. Upon a rapid admission (which I realize is never really a good sign for the patient to be scooted to the top of the waiting list), I was seated in front of an emergency physician arrogantly explaining away my symptoms. I told him that the feelings had to be a weird reaction or side effect due to all the medication I had been taking for my lungs and bronchitis. I had felt horrible over the past month and surely that would explain away the fear of my current situation. The physician kindly listened to my reasoning then explained that my theory was highly unlikely if not impossible and that we would talk further after the results of my MRI scan. MRI machines are never much fun. However, this one seemed to last for days. If you’ve ever experienced lying in a MRI machine, you know you must remain very still during the scan. The MRI scanner is a long tube surrounded by a giant magnet. This was my first such experience, and under the circumstances of no one agreeing with me that my symptoms were medication side-effects and getting put at the top of every waiting list, I was suddenly very nervous. This MRI was scanning my head and neck for answers to the odd sensation in my left side. I’m no doctor, but that did not sound good to me. During my time in the MRI there were four words that I repeated over and over. I did not know from where they came at first, but they were the only words that I could think of and they kept me calm. They were a gift during that time. The scan lasted over an hour and I simply repeated, “Jesus, give me peace.” I am certain God led me to this prayer that day. I was scared when I went in to the MRI and I was scared when I came out of the MRI. But, after asking Jesus to give me peace, he did just that. I was at peace. I was at peace that everything would turn out the way it was intended whether that peace was found on this earth or from above, yet now more than ever I was unsure of what was to come. After the MRI, the doctors came in with the news that I had a mass at the base of my brain. This was not what you expect to hear on your birthday and certainly not the present I was hoping for. Remember, it was supposed to be cake and candles and gifts and wishes. For some reason, it appeared I was getting a tumor for my birthday. A tumor that appeared to be black and somewhere between the size of a golf ball and tennis ball. An important part of this story is that when I was twenty-three years old, I had malignant melanoma. Melanoma is a form of skin cancer that if not removed or treated is very deadly. My doctors knew of my cancer history and were prepared for the fact that it had returned. 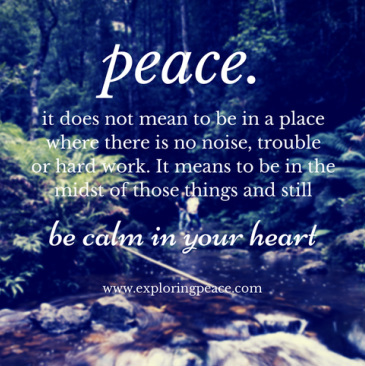 With fear hovering, the peace in my heart simply reminded me that God was in charge. Still unsure of what I was to face, Troy and I prayed with the hospital chaplain. You see, this wasn’t just any hospital. Troy and I both worked at this local rural facility in non-medical support roles. Father Pete was our hospital’s chaplain, he came in to pray with us before I was transferred and informed me I literally had an army outside the squeaky, swinging emergency room doors praying. He gave me a small wooden cross he had received in Jerusalem and I held onto that cross for my entire journey through three hospitals. Father Pete could never have known the comfort that small cross gave me. And, since seizures then started adding confusion to the fear, diagnosis and course of treatment, we were all overwhelmed and needed every ounce of peace God could offer. How it is possible to be at peace yet feel overwhelmed and confused, I’m unsure, but I was indeed at peace amidst the confusion and fear. My first ambulance ride was fast, loud, uncomfortable, and uneventful. It was amazing how many questions I was asked from the many different medical personnel who assisted me in my journey. Once arriving at the metropolitan hospital, the questions did not stop. However, these were life and death questions. Questions like “Do you have a living will?” while routine, took on an entirely new meaning that day. Troy and I discussed my living will. We talked about cremation or burial. We talked about our young son and his future. All the while, I knew we had to discuss these things so Troy and my family would be at peace if something happened to me in the midst of this crisis. Within minutes of arriving at the larger hospital, I met multiple specialists. They were leaning toward brain surgery as they expected a tumor. They kept telling me that I was young and had no known risk factors for having had a stroke to cause the left-side weakness. Anyway, there were more questions than answers. My neurologist came in and explained that I would meet one of the best in neurosurgery very soon (again, scooted to the top of the list). The plan was to take my MRI scans to the Tumor Board the next morning to put their heads together (no pun intended) and make sure which type of surgery was the right course of action. The tumor board returned after reviewing my multiple scans and tests with the conclusion that what was causing my left side weakness was most likely a tumor. We planned for surgery the next morning and it sounds silly considering my symptoms but I honestly felt like nothing was there. In preparation for the surgery, I was told that they typically only shave the portion of your head that is being operated on. I did not want half a head of hair and asked for the entire head to be shaved. I literally had to ask three times. I was sarcastically told it would cost extra but argued nonetheless. They finally took me seriously and so I got at least one birthday wish granted. The morning of the surgery I was hungry, nervous, grumpy and at peace. It seemed forever before they came to get me. Family and friends entertained me while we waited. It was a long wait. The techs finally came and Troy and I went down to the OR. I will always remember that journey down the cold hall (reminding them to shave my full head). The anesthesiologists were wonderful and talked and joked for quite a while before they got started. They even let Troy come in so he could see me one last time before heading back. I don’t remember much other than it seeming so sterile and cramped. The peace remained but it was closely accompanied by a sense of doubt and fear. That is about the last I remember before the skilled hands guided by our miraculous God continued to open my skull to remove the mysterious mass at the base of my brain. I'm told the shockingly good news came while I was in recovery. The doctors who were excited and confused told Troy and my Dad in a small room of miracles they were shocked to find no cancer. And, even better...no tumor....not even a mass. The suspicious black mass area was almost just mush. Whatever had shown up in the multiple scans and brain maps had dissipated. It was gone. It was not a tumor at all. But, they were speechless and baffled (not common for brain surgeons and specialists). I heard it whispered over my bed, "Who says that a tumor wasn't there and God didn't heal Whitney?" My thoughts are...if so many miracles happened in the Bible, why are we scared of admitting they happen today? I spent my days in the ICU avoiding further seizures and complications while the doctors tried to determine the reason of my visit. What did the professionals say happen? They did not know and it seemed they had more questions than answers. They discussed the possibility of a virus in my brain that did not make sense. I was diagnosed with a blood disorder called Protein S Deficiency (that was later proven false). The most likely and yet most unlikely diagnosis suggested that the steroid medication I was taking for my bronchitis over the last month had caused a clot to travel to my brain. A clot that looked like a tumor. No one was sure of the why of the diagnosis but it seemed a stroke had caused my left side weakness. After my surgery and stay in hospital number two, it was time to work toward regaining my strength in hospital number 3. My birthday had passed and Christmas was approaching fast. I moved into my new room in a wheelchair swollen and puffy from medicine and sore from days in bed but with my bald head smiling and proudly greeting my neighbors (who were also mostly bald but not from having begged for their heads to be shaved). Most of my neighbors in rehabilitation were old enough to be my grandparents and they were precious. I thought I would be their age when I left, God had other plans. The insurance pre-approved me for a two-week stay. However, the overachiever in me must have kicked in because I was only there for a week. I was goal oriented and wanted out of the hospital and back to my own bed and shower. I arrived in my large private room just in time for my family to celebrate Christmas. Our almost two-year old son was thrilled to see his mom (even if I did look a bit different) and sat on the hospital floor playing with blocks that were typically rehab tools and not toys. We did not open gifts. It was quiet. It was uneventful. It was peaceful. By my request (mainly because I was overwhelmed by just about any movement or noise) we did not focus on food or gifts, we just spent time together as a family. Christmas Day may be the only downtime in a rehab hospital because the only people I saw that day were those who brought my food and escorted me to the bathroom. Once my company left, it was back to business with physical, speech, and occupational therapists taking their turns getting me back on my feet. It was a tough week, an around the clock effort to make my left arm function again, clarify my speech, learn to walk, shower, and dress myself again. The new year brought in the good news that I got to go home. Once we got home I limped to the couch with my new cane and looked at our Christmas tree. It was not expensive or elegantly decorated but it was the perfect tree and I hadn't gotten to enjoy it that year. We put this particular tree up for the first time two days before my stroke. It was a brand new tree that my husband bought (to cheer me up after my hospital stay for bronchitis). It was covered in a lifetime collection of ornaments my parents gave me for my birthday each year. I sat and cried and realized just how thankful I was for my life and my family. I'd really not shown much emotion up to this point of my journey. I had peace and knew God would guide the journey. But, what a relief it was to be home again! What a relief it was to experience God’s peace at the foot of the tree. A tree that celebrated his birth. Jesus’ birthday brought deep meaning and peace to my own birthday. The tree full of nativity ornaments spoke peace over me and through me. Jesus’ birth gave much meaning to my own. Little did I know, this journey was only the beginning for me. Jesus gave me the peace to get through a near death experience. Since the stroke, my life has changed. Yes, I may still be struggling as an overachiever, a perfectionist, or one who thinks she knows all the answers at times. I’ve been given a gift that can never be taken away. A gift that grounds me and humbles me; I can hear God’s whispers more clearly and see God’s activity in new ways. You see, for my thirty-first birthday, Jesus gave me peace.